The Arctic is often viewed as a silent landscape, with few human inhabitants and several populations of hardy polar bears. But while winters are cold, dark, and quiet, summers are bright and noisy, with major migrations of birds and marine mammals. Our research group at Wildlife Conservation Society Canada studies a lesser-known aspect of Arctic complexity: the underwater soundscape. The Arctic Ocean is vast, often covered in ice, and is rarely warmer than 0 °C, yet it is host to a cacophony of interesting sounds. From the physical processes of waves crashing and sea ice cracking and whining to the sounds made by marine mammals such as bearded seals and beluga whales, the Arctic is alive with underwater sounds. We use soundscape recordings, collected with underwater acoustic recorders, to understand seasonal patterns in the vocalization and migration of marine mammals and to assess how climate change and increased shipping are affecting the soundscape and, subsequently, marine mammals. Sea ice is a key driver of the Arctic underwater soundscape; noise levels are extremely low in the winter when sea ice is solid. They can be so low that they are almost too quiet for our instruments to detect. Even during the ice-free summer, noise levels are mostly driven by changes in wind speed and are still quieter than in temperate waters further south where human activity drives up noise levels. Bearded seals begin vocalizing under the solid ice in the winter, and by spring their vocalizations are heard 24 hours a day and can drown out most other sources of noise. Bowhead and beluga whales also add to the soundscape, although to a lesser extent than bearded seals. Both whale species migrate into the region in late April and are heard from the time of their arrival until the time of their departure (late October for bowhead whales, August for beluga whales). Evidence suggests that marine mammals can be very sensitive to loud, human-made noises, even from great distances. For example, ship noise can travel more than 100 km in Arctic waters, which can disturb the behaviour of marine mammals and decrease their ability to hear one another. Bowhead whales in particular can communicate over distances of up to 100 km; loud noise from ships could decrease this communication distance significantly. 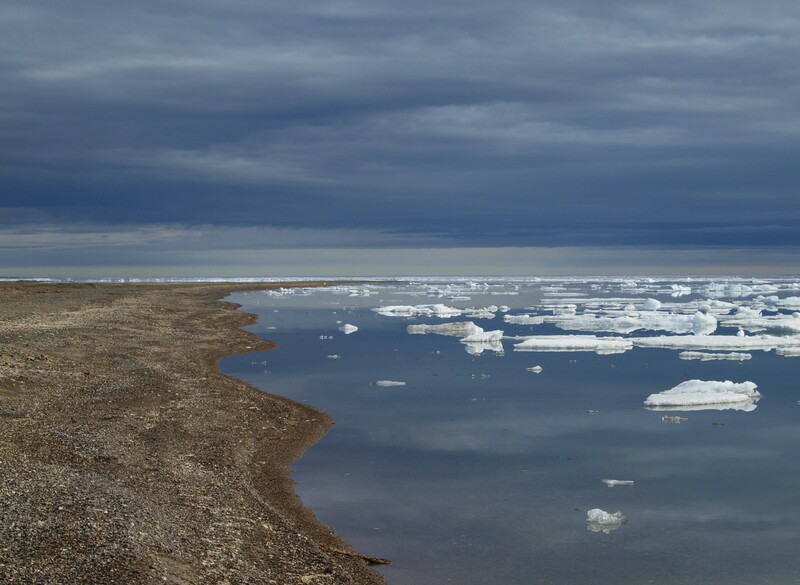 Since climate change is expected to lengthen the ice-free season, overall yearly noise levels will increase simply because there will be less solid sea ice to allow for extreme quiet. Arctic shipping traffic will also increase as the ice-free season becomes longer. 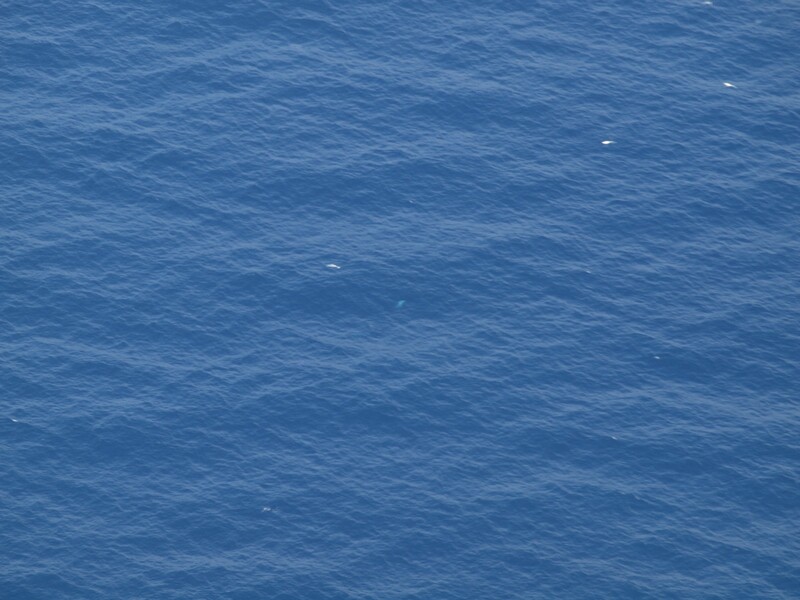 Thus, knowing when marine mammals are in the region based on their vocal activity and comparing those data with the timing of ship traffic can help managers with Fisheries and Oceans Canada and Transport Canada understand when these mammals are most at risk of acoustic disturbance and manage ship traffic accordingly. 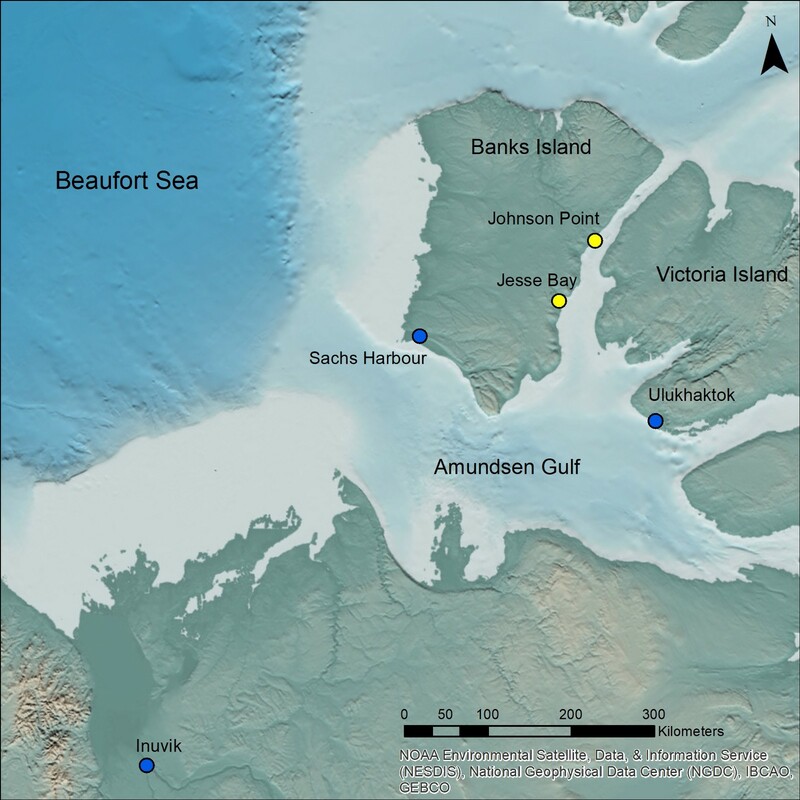 We work mainly in the western Canadian Arctic, where whales in hotspots along the mainland coast of the Amundsen Gulf or in the narrow passage between Banks Island and Victoria Island (the Prince of Wales Strait) are at greater risk of disturbance by ship noise. Up until now, we have mainly worked out of the villages of Sachs Harbour and Ulukhaktok, which are easier to access than these remote, yet important areas. Map of our study area in the western Canadian Arctic, where we study marine mammals using underwater acoustics. 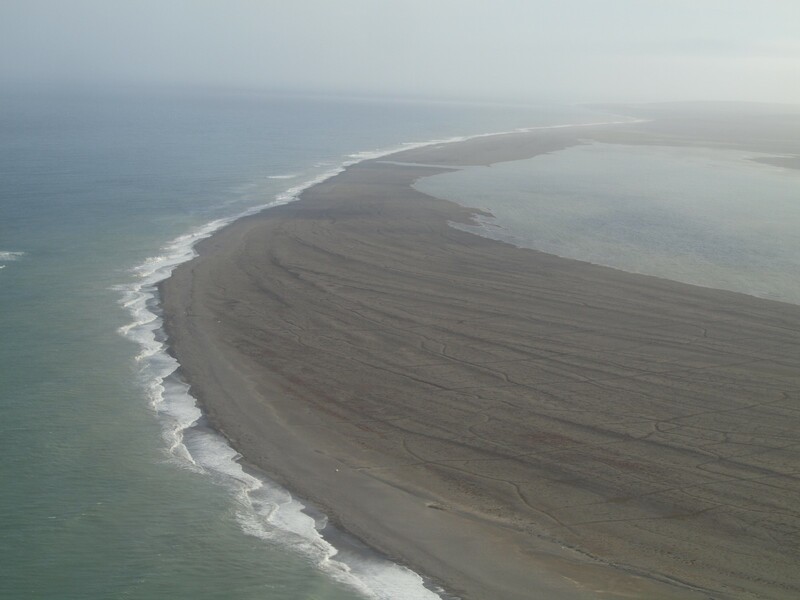 This past summer, we chartered a plane out of Inuvik and flew along the Prince of Wales Strait to deploy acoustic recorders. 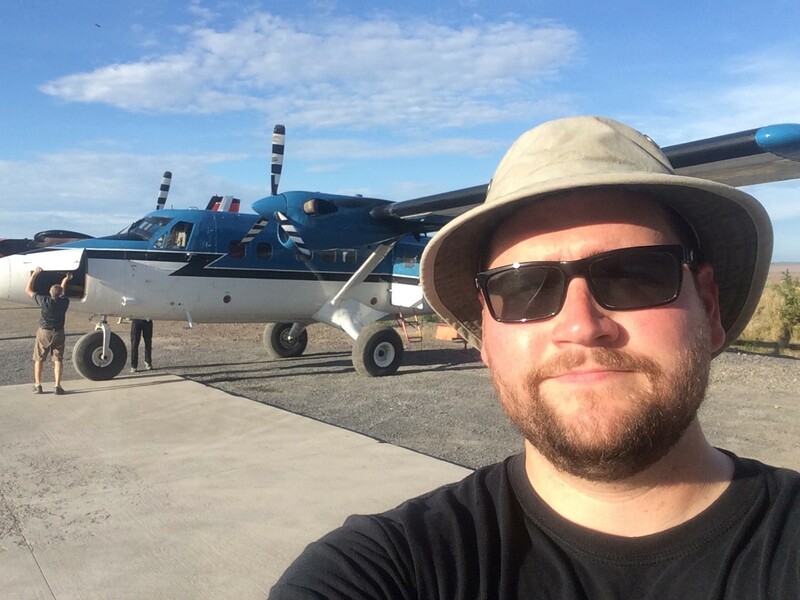 William Halliday gets ready to fly to Banks Island to deploy underwater acoustic recorders. We stopped halfway up the Prince of Wales Strait at Johnson Point. 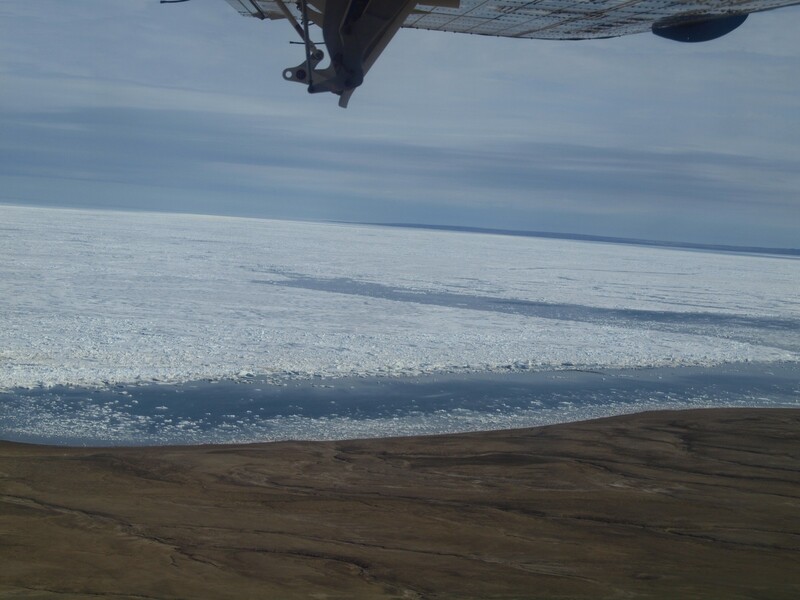 The landscape was quiet when we landed, with a few common eiders and glaucous gulls flying by and a juvenile bearded seal watching us from a nearby chunk of ice. 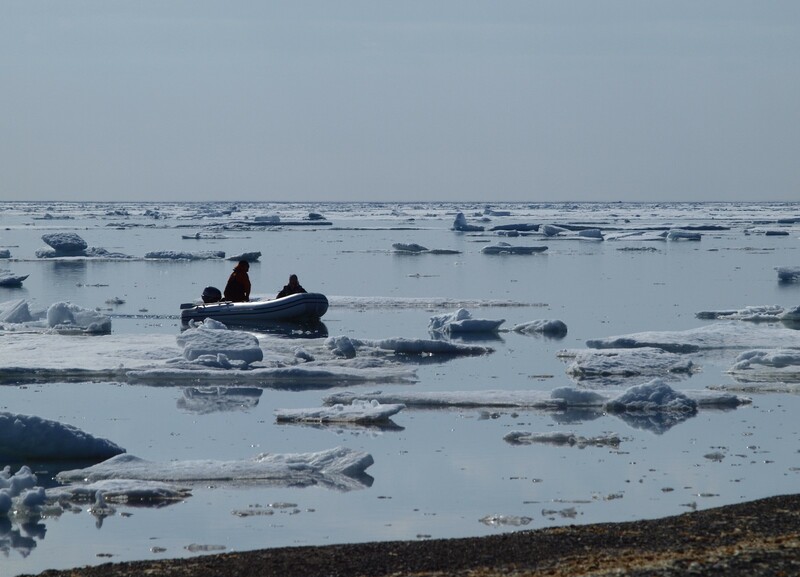 There was more ice on the water than we expected, but not enough to stop us from deploying our recorder. The shoreline at Johnson Point, looking out onto the ice-covered Prince of Wales Strait. We left the plane to deploy our recorder, having to go nearly 2 km from shore to find water deep enough (30 m) so that it wouldn’t be affected by sea ice. William Halliday and Matthew Pine return from deploying an underwater acoustic recorder in the Prince of Wales Strait at Johnson Point. Following this deployment, we flew north along the strait looking for other deployment sites. Unfortunately, there was too much ice for any more deployments, but we found many suitable sites for future years when there is less ice. Ice covered ocean at the northern end of the Prince of Wales Strait. After we turned around and headed south down the strait, we stopped at Jesse Bay, nearly 100 km southwest of Johnson Point. There was almost no ice in sight, and there was a nice flat beach to land on. However, the wind had picked up, and we were unable to safely launch our boat. Ice-free ocean at Jesse Bay, near the southern end of the Prince of Wales Strait. We returned the following day when the water was calm and deployed our second recorder. On the return trip to Inuvik we counted more than 50 beluga whales between Sachs Harbour and the mainland. 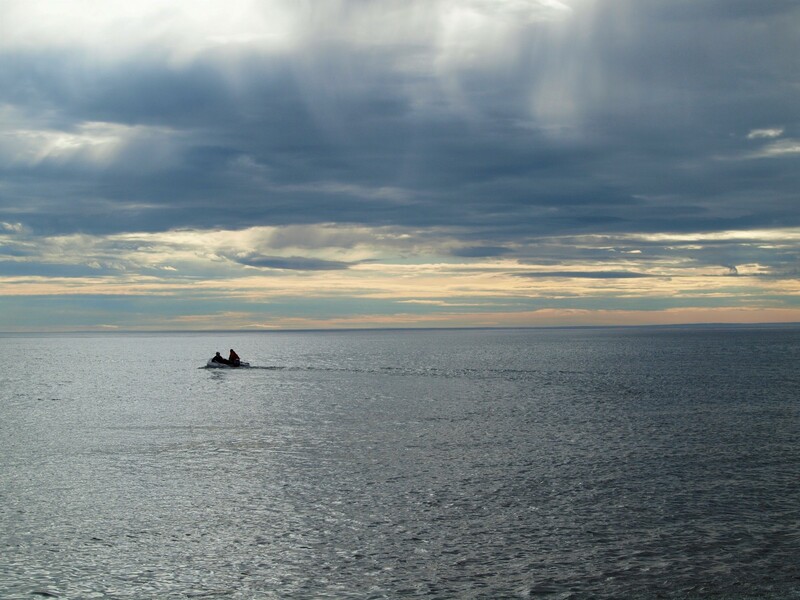 Beluga whales in the Amundsen Gulf between Sachs Harbour and Inuvik. By the end of the summer, we had deployed five recorders throughout the western Canadian Arctic. Now we wait for the long Arctic winter to conclude and for the sea ice to break up before retrieving our equipment. If we’re able to retrieve them and they’ve recorded properly, we’ll have an incredible opportunity to study spatial and temporal variation in the underwater soundscape, particularly the timing of whale migrations and seal vocalizations and variation in ambient noise and shipping noise. These results can be used to build a network of marine protected areas or adjust the shipping corridor through the region, which can allow marine mammals to have quiet spaces that are not impacted by shipping noise. Shipping is forecasted to increase throughout the Canadian Arctic in the near future, so it’s imperative that we act now to reduce its impacts. William Halliday is an Associate Conservation Scientist at the Wildlife Conservation Society Canada. Read the full paper — Seasonal patterns in acoustic detections of marine mammals near Sachs Harbour, Northwest Territories in Arctic Science.